Today in Masonic History Robert Livingston Beeckman is born in 1866. Robert Livingston Beeckman was an American politician. Beeckman was born on April 15th, 1866 New York City, New York. At the age of 5 he moved with his family to Rhode Island where the family owned Lapsley Beeckman & Co. At the age of 16 he left school to become a stock broker in New York City. In 1886, Beeckman played in the finals of United States National Tennis Tournament. He lost to the defending champion. At the age of 21 Beeckman became the youngest person to hold a seat on the New York Stock Exchange. In 1902, Beeckman entered politics in Rhode Island when he was elected to the General Assembly. He served from 1902 to 1912. From 1912 to 1914 he was elected a state senator. 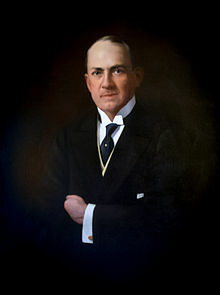 In 1914, Beeckman was elected at the 52nd Governor of Rhode Island. During his administration, which ended in 1921, he pushed for a variety of changes in public health, the prison system and veteran affairs. In the health care arena he pushed for reforms in the hospitals and insane asylums in the state. In the prison system he established a state Parole Board. He also established an inheritance tax. As a sitting Governor during World War I, he went and met with soldiers on the battlefield in France. When he returned home he pushed the state legislature to take better care of the dependent families of Rhode Island servicemen. He also reformed the voting laws in the state, changing them so that non-landowners could vote. Essentially introducing universal male suffrage in the state. After Beeckman's three terms as Governor, he ran, unsuccessfully for a United States Senate seat. Beeckman passed away from a heart attack on January 21st, 1935 at his summer home in Santa Barbara, California. Beeckman is listed in a variety of sources as a Freemason. At the time of the writing of this article, his lodge affiliation is not known.